John Honeyman & Keppie's work at this large red-sandstone house was primarily decorative, including substantial painting work in the house, stables and a gardener's house; new fireplace fittings in several rooms; and plumbing. The work coincided with the apparent acquisition of the property by client Thomas Dunlop. 1 Woodbourne is located a short distance from Dunloe. 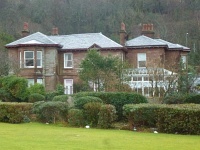 1: Dunlop's home address in the 1904–5 Glasgow Post Office Directory is given as 'Waterside Cottage, Langbank'. The following year it is 'Woodbourne, Wemyss Bay'. Glasgow Post Office Directory, 1904–5, p. 200; 1905–6, p. 267.